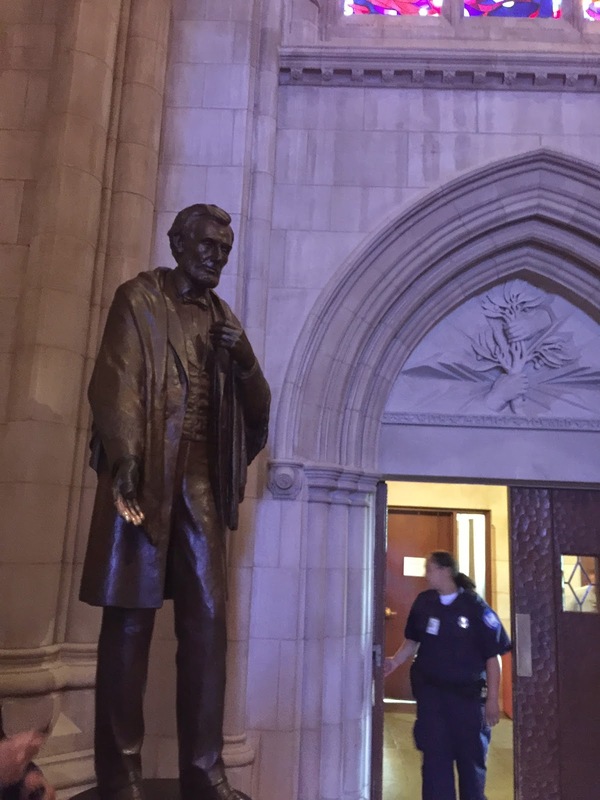 So you thought you knew Washington's National Cathedral... but did you see the life-size statues of Lincoln and Washington in black and white respectively, near side entrance doors, with appropriate symbolic stories in stained glass high above the door? See a tiny piece of the moon in a very contemporary styled glass window? Fnd the gargoyle of Darth Vader from "Star Wars" among the many stone faces carved by hand throughout? Know that the organ has - truly - 10,000 pipes (ever try to find them all?)? Estimate that the bell tower weighs 9000 tons? That all the limestone used comes from Indiana? Learn that the only president buried in the Episcopal Cathedral was a Presbyterian - Woodrow Wilson - whose grandson Francis Sayre ( born in the White House) became one of the institution's longest serving Deans? Among the many arts on show throughout are priceless examples of wrought iron done by American master blacksmiths, whose work - especially gates of great individuality - are of astounding skill and delicacy? (Among them is the "Good Shepherd" gate by Albert Paley, a very contemporary sculptural piece on the lower level. ) The metal work finally is being honored in a lavishly illustrated book on sale in the Cathedral shop as well as in the National Building Museum. One of the authors is Barry Bem, a volunteer guide who wears a gold tie with a delicate design representing the iron and metal work that he proudly shows off to visitors. Needlepoint also is found in abundance, including a wall-size needlepoint tapestry illustrating the seals of all 50 American states. The variety of handiwork on the kneeling cushions (" kneelers"), includes one done by Great Britain's Queen Mother in homage to America's role abroad in World War II. Don't expect Mr. Bem to show it to you, since one, this like some other prized possessions, are hidden away in what he refers to as 'the Cathedral collection."